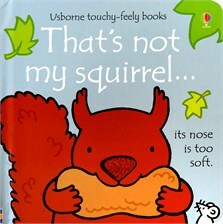 There are five mischievous squirrels to meet in this touchy-feely board book, all with soft noses, rough paws and fluffy tails. The bright pictures and textured patches for babies and toddlers to stroke are specially designed to develop sensory and language awareness. A delightful book to share with little ones. Another welcome addition to this wonderful series of touchy-feely books which bring endless smiles and a great to read again and again. The books have thick front and back covers, and thick pages too - so they will withstand babies being rough and chewing them too! After only a couple of times reading this with my daughter and showing her the different textures, she takes the book off to read by herself and knows what bits to feel.